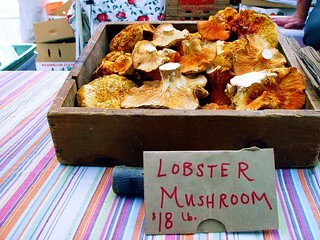 This shot and Foraged & Found Edibles -- Lobster Mushrooms Macro continue my focus on adding color to my photostream. Foraged & Found Edibles don't have a Web site, but they have a presence online and in Seattle locals' hearts (and stomachs). On the fine August day above, Chef Seth Caswell of Stumbling Goat featured the mushrooms in his cooking demonstration at the Ballard Sunday Farmers' Market, to support the 100 Mile Diet advocated by Sustainable Ballard. Recently in Food & Wine, Michael Hebberoy discusses connections to Seattle's underground supper club scene. The prescient Seattle Bon Vivant featured their Chanterelles in October, 2006, en blog and here on Flickr. Elsewhere in the local foodie blogosphere, The Ethicurean interviewed a (Found &) Forager in September, 2006. Earlier in March, 2006, Seattle P-I Food Editor Hsiao-Ching Chou featured Justin Neidermeyer of Pian Pianino Pastificio Artigianale. As she notes, Justin includes Found & Foraged mushrooms in his incredible pasta, which is also available at the Ballard Sunday Farmers' Market.